That Canada stood in defense of freedom is thus central both to George V’s 1939 message, and to that offered by Veterans Affairs in 2015. 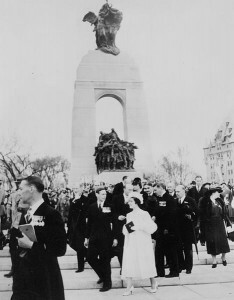 Further, the assertion that the cenotaph symbolizes all Canadians who have sacrificed “in the cause of peace and freedom—past, present, and future,” serves to legitimate not just Canadian participation in World War One, but all Canadian military actions since then. Accordingly, it behooves us to think critically about the notion that the over 66,000 Canadians and Newfoundlanders who died in the Great War sacrificed themselves for the cause of freedom. First, who were Canadians and Newfoundlanders fighting alongside? It’s true that the two great European democracies – Britain and France – were our allies, as, eventually, were Italy, another democracy, and the United States. However, Russia, the most autocratic and authoritarian regime in Europe, was also a key partner. Furthermore, the “free” democracies, Britain and France, maintained massive overseas Empires collectively subjugating hundreds of millions of people who lived without freedom and oftentimes in very dire circumstances. Clearly, to argue we were fighting for “freedom”, therefore, you have to ignore the unfree status of the subjects of the Russian, French, British, Italian, and American Empires. Indeed, many conscripts from the European empires literally fought alongside Canadian soldiers in northern France. When Canadians were among the first soldiers in the world to be gassed by the Germans at Ypres in 1915, for example, in the trenches beside them were troops from French Algeria and Morocco. Ignoring the unfree peoples of the empires is deeply Eurocentric and perpetuates a historical injustice. One can even question the degree to which the people of Canada, Newfoundland, and their allies were themselves “free” in the 1910s. Certainly, if freedom entailed the right to a say in politics then many citizens’ freedom was not fully realized. First, in none of these states did women have the right to vote, meaning that over 50% of the population of the age of majority lacked the franchise. Second, while France following the founding of the Third Republic in 1870, had truly universal manhood suffrage, this was not the case among the other allies. Canada disenfranchised men who had “Indian” status (with some exceptions), as the state used the franchise as an incentive to assimilation. Across the country – the situation varied from province to province – property and residency requirements further restricted the right to vote meaning, effectively, that many working-class and immigrant men were denied the ballot as well. In Great Britain, the situation was similar: all male property owners and rent-payers could vote, but this still excluded, by some estimates, up to 1/3 of men of the age of majority. The same restrictions, moreover, operated in Newfoundland. Likewise, Italy used property restrictions to limit male suffrage, and in the United States, following the Reconstruction period in the former states of the southern confederacy, millions of African American males were denied their democratic rights through the Jim Crow laws and violent intimidation. Russia, of course, lacked responsible government and only a precious few were eligible to vote for representatives of its parliament (the “Duma”), which had, at any rate, been effectively neutralized by Czar Nicholas II in the years following the Revolution of 1905. Whether Canada, Newfoundland, and their allies represented the cause of freedom becomes yet more muddled when one examines the situation in Germany, their principle enemy. It is true of course, that Germany, like Russia, lacked responsible government, meaning that the German parliament (Reichstag) could vote no-confidence in the government and that this would not trigger an election so long as the cabinet retained the support of the Emperor (Kaiser). But the Reichstag did have the critical power to approve budgets and, importantly, German men, like their French counterparts, had truly universal manhood suffrage: all men the age of majority could vote. Could men in Britain, Canada and their allies thus claim to be more “free” than their German counterparts? Certainly, Russian men could not; as for the others, the answer is at best unclear. But perhaps we were fighting for freedom in a different sense? Maybe we were fighting for the freedom of nations rather than individuals, for example. After all, Austria-Hungary was trying to end Serbia’s independence, and the Germans invaded France via neutral Belgium, so one could argue that we were fighting to preserve the freedom of Belgium, France, and Serbia to exist as sovereign nation states. This is only slightly more credible. Once again, you have to ignore the fact that western states, including Canada, did not give a fig about the freedom of nations in many other parts of the world. The British Empire alone, with which most Canadians still strongly identified and of which Newfoundland remained a colony, included many dozens if not hundreds of nations under its yolk. The Russian Empire was constructed without regard for the national aspirations of Ukrainians, Poles, Lithuanians, Latvians, Estonians, Chechens, Georgians, Chukchis and more. Canada itself, for that matter, was a European nation state occupying the historical territory of Canada’s First Peoples/Nations. Newfoundland, as a colony, was similarly built upon the ancestral territories of the Beothuk and Mi’kmaq peoples. If we were fighting for the freedom of nations, then we were certainly not applying our commitment to that freedom very evenly. In truth, although Britain entered the war in defense of Belgian neutrality, it did not do so out of any concern for “freedom” but to preserve the balance of power in Europe – its strategic goal on the continent since at least 1815. France entered the war because of its alliance with Russia, which it had formed to preserve its dreams of avenging its loss of territory in the Franco-Prussian War of 1870-71. French leaders feared that should Russia be defeated by the Germans and Austrians, France’s position as a continental power would be finished. Russia entered the war to protect the Serbs, whom the Russian elite perceived to be fellow Slavs, as well as to keep Austro-Hungarian power out of the Balkans, an area the Russians hoped to dominate themselves. Italy entered the war in 1915 for what were even crasser reasons – the promise of territory from their new allies. Why did Canada enter the war? Canada largely joined in because Britain did; sadly, the debate never really got much beyond that in government circles. And Newfoundland, as a colony, really had no say in the matter at all. So we didn’t fight the war for freedom, which begs a host of questions. These include (but are certainly not limited to) the following three. If 66,000 plus Canadians and Newfoundlanders did not die for freedom from 1914 to 1918, what did they die for? Who was responsible for those deaths? How should we remember the sacrifice of those 66,000 victims of WW1 on Remembrance Day if Canadians and Newfoundlanders were indeed fighting on the battlefields of Europe from 1914-1918 for morally ambiguous reasons? None of this is meant to disrespect the memory of the more than 66,000 who gave their lives. Many no doubt believed the propaganda they were being fed: that they were fighting for some higher purpose such as freedom. Many others may have enlisted for more banal reasons like a desire for adventure; some were fighting because, in fact, they felt a strong allegiance to the British Empire. Regardless, we shouldn’t allow the propaganda messages of the WW1 era to be perpetuated ad infinitum. The memory of the Great War should not be reduced to simplistic sloganeering about freedom, as in the words of George V or the text of the Veterans Affairs website. Recognizing the ambiguity and complexity of the Great War requires us to acknowledge that our more than 66,000 honoured dead were sacrificed by our leaders for very poor reasons indeed. It should also prompt us to think critically about the deployment of our military in other conflicts, past and present. Geoff Read is an associate professor of history at Huron University College. Given that the Veteran’s Affairs site is describing a Cenotaph that also commemorates WWII soldiers, where “freedom” as we understand it today was unquestionably an (imperfectly realized) motivating ideal, I think using the word is forgivable. Given that King George was speaking in 1939 as Britain preparing for an existential struggle with Nazi Germany, that he would speak in terms of freedom as well is also eminently understandable. The multi-page history of WWI that Veteran’s Affairs provide on the same site doesn’t mention freedom as a motivating force or outcome of the war. It, presumably, better reflects their thinking on the topic than an introductory paragraph about a hunk of concrete. Besides, I don’t even think the soldiers were told they were defending “freedom”: most of the documents I’ve seen from the time portrayed it more as defending British civilisation, except in Quebec where the propaganda stressed sentimental appeals to protect Mother France. As true as all these points are, I am not sure pitting your argument against Veteran’s Affairs is entirely fair. Remembrance Day has taken a turn – but I don’t think it is the government that has done that, or at least not deliberately. I think it’s that World War II, closer in time and with fought against an unambiguously evil adversary, has cast WWI in its shadow and – to a degree – merged the two conflicts in the popular imagination. In other words, to mangle a phrase, the “Good War” is the enemy of the Great War. Hi Mark – I think there is a good deal of validity to what you’re saying, particularly about how the memory of WW2 distorts the memory of WW1. The only thing you say that I would disagree with strongly is “Remembrance Day has taken a turn – but I don’t think it is the government that has done that, or at least not deliberately.” I think if you look at the now defunct Conservative government you will see that they quite deliberately reframed Remembrance Day and the memory of WW1 in the ways I’m reacting against. Observe, for example, the nationalist (and completely bogus in my view) cult constructed around the memory of Vimy Ridge in World War One by the Conservatives and their allies. Perhaps we’ll see a change in tone under the Liberals – I certainly hope so. Actually Canada was still a British Colony in 1914 & was automatically at war when Britain was.Neither the government nor the schools emphasize that WW1 was Canada’s War of independence.It was their George Washington crossing the Deleware only it was done on the fields of Belgium and France.With that came the Statute of Westminister `1931 giving Canada full independence from Britain under Sec 3 of the Act.The British Crown was also thus divided as a result.Sec 4 as far as Canada is concerned was repealed by the Constitution Act 1982. Hi Geoff, thanks for the reply. I agree that the Conservatives definitely had an agenda as pertains to history: I think the popular misconceptions about WWI predate them though, as does the wrong-headed emphasis on Vimy. I should have been more precise – I meant the state, since 1919, not any specific government, has not done anything in particular to create the misconceptions about the Great War. My feeling is that the Conservatives made things worse by how they framed Canadian military history as a whole, but I believe that they were picking up and running with a narrative that was already out there about WWI in particular. This does not affect the argument of this essay, which I appreciated reading. However, the statement, “…in none of these [allied] states did women have the right to vote, meaning that over 50% of the population of the age of majority lacked the franchise” is not correct. Women had the right to vote in New Zealand and Australia. Canada was lagging behind. Colin – thank you. Good point. I wasn’t thinking of them clearly. I think your points are important, Geoff, and I hope they can add a little context to public reflection on WWI (and others). And I think it should get us thinking about what freedom is. I think freedom was defined as something for the supposedly deserving (the civilized, the modern) to a greater extent in the WWI era that today, when it is more commonly assumed that we all deserve to be free – whatever that means. The motivation to fight for the freedom of small nations, in my opinion, deserves more credit, then, because of the view that having managed to become nations, the Serbias and Belgiums had earned the right to expect their freedom to be defended by other right thinking nations. I would argue that plenty of people in the British Empire rationalized the war in these terms into 1916, before the war really changed into something no one could properly wrap their heads around, and Woodrow Wilson certainly meant something like this when he finally offered Americans reasons to go to war. Of course, propaganda encouraged populations to see things this way, which brings us back to the question of what freedom is. There is also the question of fighting for freedom, and I think there was truth in this too, but not the way Vet Affairs implies. Minority and marginalized groups in Canada and elsewhere embraced the opportunity, often, to take part in the fight and be seen as equal or deserving members of the nation or empire – or perhaps partners for some First Nations. They were often denied this opportunity, as your piece helps us remember. Thanks for the contribution – history rants are important! Paul – as Newfoundland and Canada were both dominions you are right to point to a false distinction I make there. Britain’s declaration of war applied to both – although they both retained some freedom to determine the form and size of their contributions to the war effort. Nathan – thank you for your comments. Thoughtful and interesting to consider. Mark makes the point above that the rhetoric of “civilization” was often invoked by contemporaries. That certainly holds true in France alongside a discourse of defending French liberty. “German barbarism” was another common theme of both commentary and outright propaganda of course, allowing the enemy to be cast as an enemy of civilization. Your idea of a plural vision of “freedoms” and their meaning for different groups is an intriguing one. As Geoff Hudson pointed out on my FB page yesterday, certainly the Belgians could rightly feel they were defending their own freedom. I can’t say I was ever comfortable with the concept that World War One was in any way a fight for freedom, save for events in the Balkans–a place all but discarded and forgotten as a footnote in the historical discourses of the ‘Great Nations’ involved. In our history books, we read that the spark that started the war was the assassination of Archduke Ferdinand, in which Austria-Hungary declared war on Serbia, Russia declared war on Austria-Hungary, Germany declared war on Russia, France declared war on Germany, Germany invaded Belgium, Britain declared war on Germany…and nothing after that is recorded to have happened in the Balkans. The Western-centric view–the war was Western European (except for Gallipoli–and oft we don’t even talk about how Turkey became involved in the war), with a side-show in Russia. We rarely talk about the laws, actions, and international practices and policies of the nations involved in the war. In viewing the pre-war history of Germany, France, and Britain, there is little to distinguish them in terms of government, law, and rights and freedoms afforded to the citizens within the nation. But at the same time, there was much suppression and abuse of human rights and freedoms within the territories held by those nations–more so for Britain and France which sought to use military force, both before and after the war, to prevent an indigenous voice. It was “European Rule”– in much of Africa, Asia, and parts of South America. They did not get a vote, and protest was not allowed. For Russia, it was a autocratic monarchy, with no tangible rights to the people. They did not get a vote, and protest was not allowed. Freedom–but only if you were European. The shot fired at Archduke Ferdinand was an expression of that lack of freedom–the suppressed taking a shot at the authority, in hopes of causing change. It was, essentially, a shot that was aimed at all the monarchies and authorities. It was a shot for freedom–as misguided and flawed as it was–at what the British Empire, the French Empire, the German Empire, the Russian Empire represented: occupational government. Oh, and there is more to the pre-war history: nations rivalled against nations– Germany and France, Austria-Hungary and Russia, Turkey and Britain. All spurred on by the desire for Empire–more territory, more land to rule over. And so, in the name of “Empire”–the conquering and suppression of weaker peoples in the name of National Glory–navies and armies were build, and navies and armies were built to counter those navies and armies. And so, when the Nations of Europe went to war, there was little “freedom” behind it. It could be said it was for the opposite reason–that of maintaining control of one’s Empire, and making it bigger. And Canada, Australia, New Zealand, India were dragged into it by decree of the King of Great Britain–noble in its aim to protect Belgium, even if Great Britain denied freedom to many of its subjects. The only nation for which freedom was really fought for was Belgium, caught in the middle, used as a path of invasion for one nation in its strike at another, and Serbia, which sought to protect its ethnic population from the suppression of the Great Empires. Did we fight for their freedom (Belgium and Serbia? ), even if the Great players were responsible for creating the very circumstances which robbed those nations of their freedom? I would say that the freedom gained was that of learning, even if it took nearly another generation and another war, that Empire was a form of suppression. May We Remember, so that they may not have to experience what others have had. May We Remember on this day, and on every day. But the farmer, the baker, the enlisted man. To pit the innocent against one another. And pray “Never Again!” for every one. The farmer, the baker, the enlisted man.